Danielle Weis is Spring Forward PT’s Clinical Director and Senior Staff Physical Therapist. Danielle earned her Doctorate of Physical Therapy (DPT) with Honors from Columbia University’s College of Physicians and Surgeons with a focus on advanced orthopedic treatments. She then obtained her Orthopedic Clinical Specialist certification (OCS) through the American Board of Physical Therapy Specialties in 2018. Prior to receiving her doctorate, she graduated with her B.A. in Biology from Yeshiva University. Danielle has vast clinical experience in treating adults and geriatric patients in a variety of settings, including multiple New York City physical therapy private practices and New York Presbyterian Weill-Cornell Hospital’s acute care medical, surgical, and burn units. 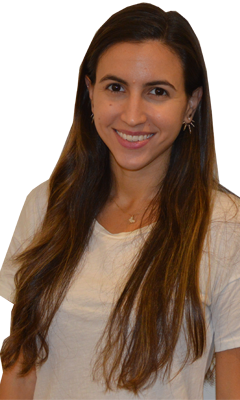 She currently serves as a guest lecturer for DPT graduate students at the City University of New York, and volunteers as an alumni mentor for careers in physical therapy at Yeshiva University. Treating patients with orthopedic injuries and conditions is Danielle’s primary passion. Every case is unique, and Danielle customizes her treatment sessions to suit each patient’s distinct needs. She places a premium on patient collaboration, working closely with her patients to realize and actualize their goals—whether they comprise hiking in the Swiss Alps, completing a triathlon, or climbing the stairs of a 3rd floor walk-up. Danielle’s treatment style emphasizes manual, hands-on therapy in combination with guided therapeutic exercise prescription and neuromuscular rehabilitation. This process treats the underlying causes of injury, not just the symptoms, while promoting greater health and wellness. Danielle is an active member of the American Physical Therapy Association and has participated in continuing education on topics including manual medicine, muscle energy technique, pregnancy and post-partum, temporomandibular joint dysfunction and craniosacral therapy.